The Cobblers have signed Oxford United goalkeeper Ryan Clarke on a two-year contract. The 33-year-old was not in Oxford manager Michael Appleton’s plans and was deemed surplus to requirements at the Kassam Stadium despite having 12 months remaining on his contract. Cobblers boss Wilder has moved quickly to snap up the shot-stopper, who was Oxford’s longest-serving player. He was signed by Wilder for Oxford in 2009, and went on to make 264 appearances for the club. Clarke was the regular United goalkeeper for most of last season, and played in their 3-1 win at Sixfields in October. He is the second goalkeeper to sign for Town in the space of a week, following on from Adam Smith from Leicester City, and Town boss Wilder is a happy man. “I know supporters have been looking at our dealings through the summer, and I recognise we have taken our time with the goalkeeping situation, but I have to say I am absolutely delighted with the acquisitions of both the keepers we have signed,” said the Cobblers manager. “They are here for the upcoming season and the next one as well as they have both signed two-year deals, and that position now is really well covered. “We have a good blend of experience with Ryan in games, and we have the potential of Adam. Clarke hails from Bristol, and began his career with hometown club Bristol Rovers. He made 23 appearances for the Gas over a six-year period, and enjoyed loan spells with Southend United, Kidderminster Harriers and Forest Green Rovers, before dropping out of the Football League. After leaving Bristol Rovers, Clarke signed for Salisbury before then moving on to Northwich in 2008. 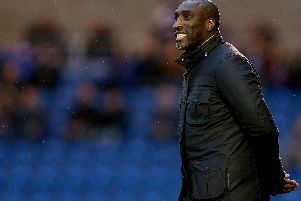 While playing at non-League level, Clarke impressed Wilder, who was at the time managing Halifax, and when he got the job at Oxford, Wilder made his move for the goalkeeper. And now, with the Cobblers in need of a shot-stopper following the end-of-season release of Matt Duke and Shwan Jalal, Wilder has gone back for a player he knows very well. “Speaking to Ryan, it was perfectly clear from a long time ago that he wasn’t going to be part of the manager’s plans,” said the Cobblers boss. “I know him really well, I know what his character is about and we have got an excellent goalkeeper. “I think if you ask the majority of Oxford fans, of not all of them, where do they rate Ryan in the history of goalkeepers at their club, he will be right up there at the top. Clarke could be in line to make his first appearance for the Cobblers in Sunday’s opening pre-season friendly against Sileby Rangers at Fernie Fields (ko 3pm).